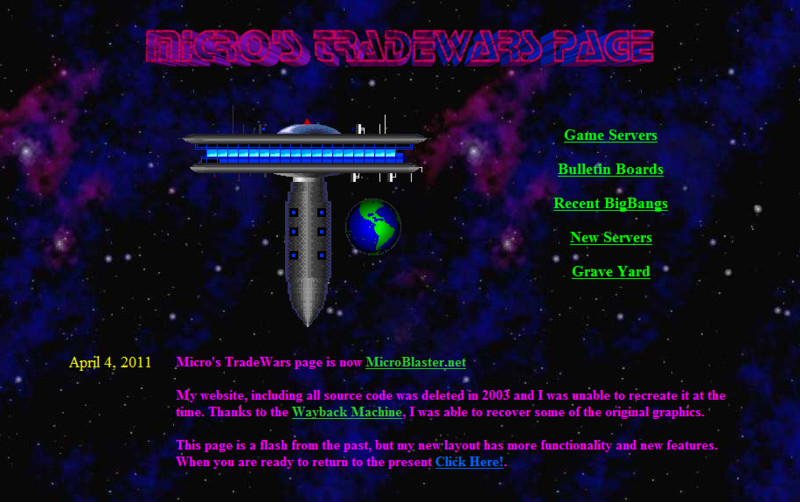 In Honor of the 25th Anniversary of TradeWars that was released June 5th 2011, I have decided to re-create my TradeWars server list. I have written a brand new crawler called MicroBot, which is written in C# and uses the .net CodeDom runtime compiler to script multiple telnet sessions at the same time. Don't be alarmed if you see MicroBot logging into your server, as it's just there collecting game stats. March 5, 2012 - TWGS 2.20b / TW 3.34 patch released. TWGS v2.20b is available for download at http://www.eisonline.com/downloads. There are several minor updates and changes, but one major bug fix. When a player is moved by planetary TransWarp, the ship's sector is not properly changed, leaving the player and ship out of synch. This will happen commonly in games, so I recommend getting this update. Special thanks to Runaway Proton for preserving a copy of the TWA DB. June 11th, 2018 - New Adventures! If you enjoy this site, please feel free to use the following banner to link to us. We appreciate your help spreading the word! My website, including all source code was deleted in 2003 and I was unable to recreate it at the time. Thanks to the Wayback Machine, I was able to recover some of the original graphics. If you prefer a flash from the past design, check out the retro site http://www.microblaster.net/retro. And of coarse we must have BTO Taking Care of Business, as this was the 8bit MIDI song on my original page :) Does anyone remember what the other song was?